The AMOK Draumr Hammock fits in the hybrid hammock category: part gathered end hammock, part bridge hammock. It certainly has a stunning visual appeal. Manufacturer: Amok Equipment. Made in Norway. 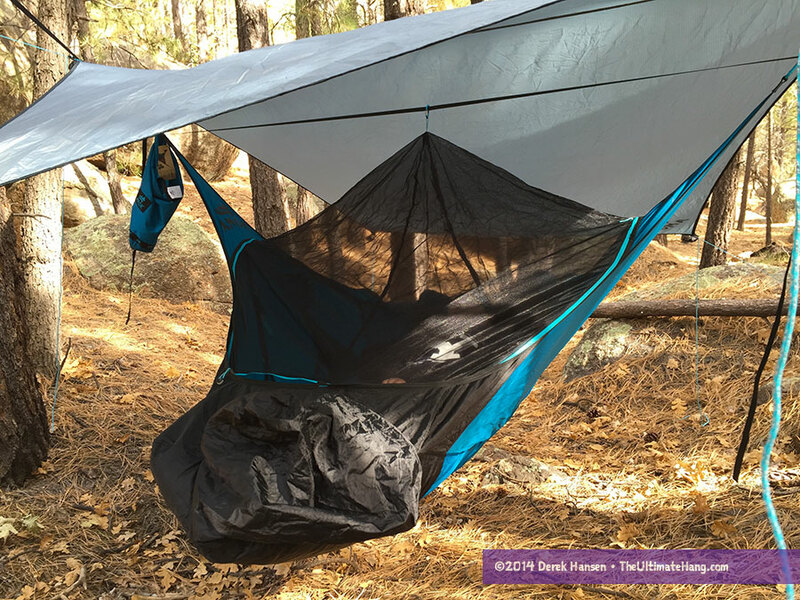 The Draumr hammock was certainly a show stopper at the 2014 Texas Hammock Hang—nearly everyone who stopped by the demo I set up was amazed, not only by the design, but also by the comfortable lay. For me, I was really, really impressed by the build quality and the attention to detail that the Amok crew has put into this hammock. This hammock is one of only a few hammock kits that includes everything out of the box: hammock, bug net, tarp, suspension system, and event matching stakes. And speaking of matching, everything on the Draumr is tied together: blue guy line, blue stakes, blue fabric, blue trim. It’s quite stunning. The construction is absolutely top tier. There are even webbing flaps to protect the tree from the carabiners. Setup on the Draumr is amazingly streamlined. I love how the team thought through all the details to get the hammock pitched. Color-coded carabiners indicate the steps taken to get the hammock up. The first carabiner (red) secures one strap to a tree, followed by the second carabiner (green). The hammock stays stowed in the stuff sack, yet everything is still connected. 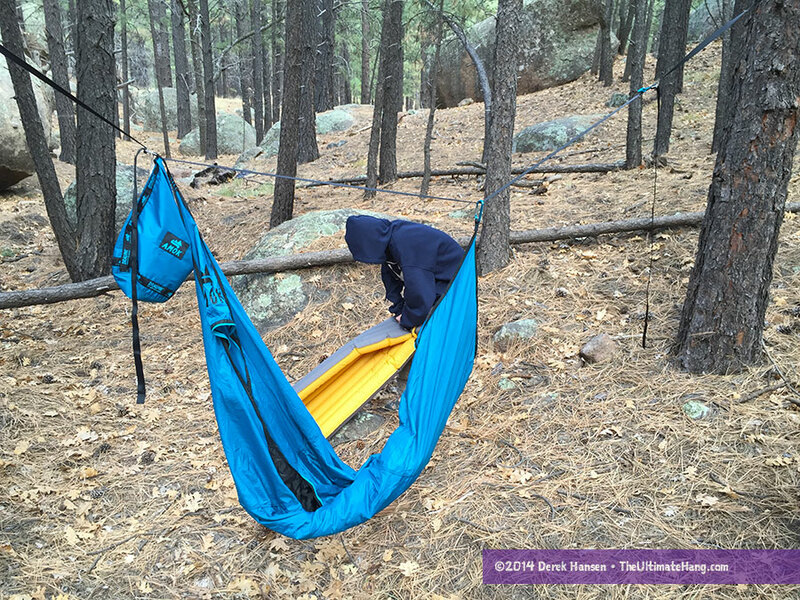 The final blue carabiner pulls the hammock out and finishes the first stage of the pitch. The cinch buckle system makes adjusting the straps easy along the webbing. 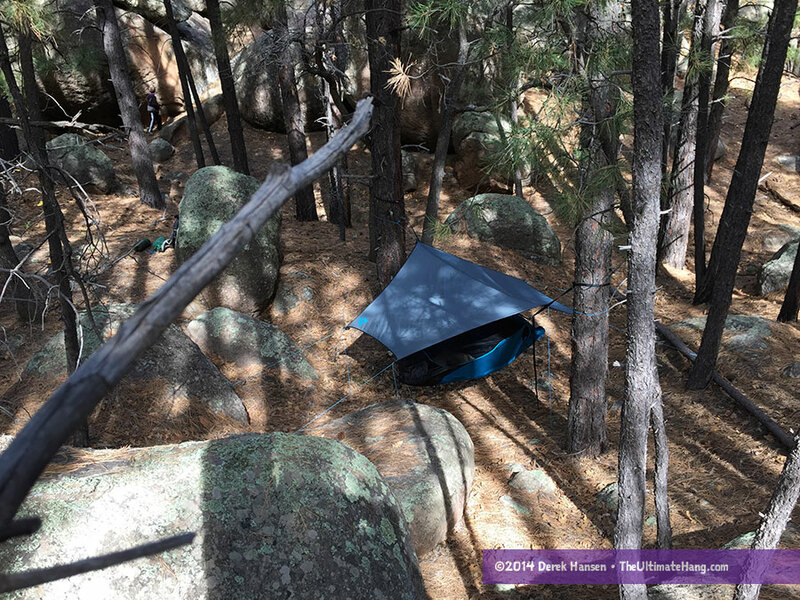 The included tarp is adequate—it’s a small hex tarp that has been designed to fit the shorter length of the Draumr. Everything is included to pitch the tarp, but my favorite feature are the tiny mesh stuff sacks on each tie-out point where you can store the guy line. Here’s the big catch on the Draumr: the hammock doesn’t work without a pad. And not just any pad; you’ve got to use a thick, firm pad to provide enough structure in the hammock for it to work. I tried using every pad I owned including closed-cell foam pads and small inflatable pads. Amok spells out explicitly what types of pads will work on their website. If you don’t already own one of these pads, you’ll have to invest in one to make this kit work. Without the right pad, I literally bent over backwards in the hammock. With the right pad, the hammock works perfectly. I used an EXPED Synmat UL 7. Packing up: deflating and stowing the pad. The zippered hideaway bug netting is pretty cool. It stores in a stuff sack off to one side and so it can be stowed when not needed. When bugs are a problem, it easily zips around the perimeter. There is a tab on the head end that can be guyed out to provide more head room. Getting inside the Draumr takes practice. The demo videos make it seem pretty easy, but even with the amount of time I’ve had with the hammock, it still takes some fiddling. Demoing the hammock to new folks was also very interesting as I did my best to help position people into the hammock. Folding up the foot end really helps in getting in, as illustrated in the Amok videos. Once inside, everyone loved the lay, and even a few played with the adjustment straps to get into a more sitting position. Getting out is much easier, but you have be a little careful not to slide out. The Amok Draumr hammock is one of the most thought-out, well-designed hammocks I’ve seen in a while. I love that it comes as an all-in-one-kit, but I think some folks will want a larger or more encompassing tarp for more coverage (the hammock is pretty exposed to side-sweeping drafts). The biggest downside with this hammock is that it cannot be used without a thick pad to create the full structure. This can also make it difficult to use the hammock in hot and muggy seasons when a hammock’s superior air circulation is desired. At 2 kg (about 4.5 lbs), it isn’t the lightest hammock on the market, but when you consider that includes hammock, tarp, stakes, and bug net, it isn’t so bad. Everything packs into a single stuff sack that is pretty easy to carry. But.. There are too many times I hang and unexpected winds blow thru.. especially in the winter months. Which causes me to tend toward end-gathered hammocks, so I can get the tarp down low and tight.. I call it taco-mode. Your Texas Hang location looks like a hammocker’s paradise!!! Thanks! I do my best 🙂 Yes, I think getting a “winter” tarp for the Draumr is a good idea. I like it. One of the few hammock ideas that is actually unique and hard to replicate. It seems like most of the ‘new’ hammock-camping products that come out are slight retweeks of something that already exists. It would take more than $379.00 worth of time to build one of these. I love the chair position. In terms of basic durability, and a level of comfortable assurance, I think Anything short of a 350lb weightlimit is needlessly borderline. Any plans for a beefier option in future? One I can have Full Confidence in?? Great observations and feedback. I’d recommend talking with the folks over at Amok to share with them your ideas and concerns. If I were to guess, I think one of the challenges with this design is that it has stressed construction points (stitching) that may be weakening the fabric. It’s a trade-off with the design. I’m sure there are ways to mitigate that, but it might result in a weight increase — again, another trade-off. I can only imagine the difficulty a manufacturer must face when deciding where along the spectrum of cost, durability, and features in order to get a system that will hopefully sell and perform as hoped. Why doesn’t anyone talk about the balancing act it seems you have to play to get a level lay. Yes you can lie flat but you may find yourself in trendelenburg through the night. I love this idea and want it badly to work, but it seems that you have the possibility of ending up on your head on the ground if you scoot to far up or same thing might happen if you scoot too far down. Getting it level seems to require some finesse. I just wonder how much time you will actually spend figiting around to stay level, and i hope know one comes and pushes you out, it seems to easy to do that. Chad, I think you have some good insights. When I showed this hammock off during some group presentations, it turned out to be pretty stable with a lot of folks wiggling around and adjusting their position. It held shape really well. The model I have does require an inflated sleeping pad, otherwise that structure goes away and leaning back on your head is a possibility. I understand Amok has come out with a new version, but I don’t know what enhancements have been made (if any). I’ve become addicted and have turned into a psycho hammock collector…I bought one after seeing the Norwegian ‘winter trip’ video. I’m pretty psyched because it should have been delivered yesterday evening. I bought a Big Agnes Insulated Pad and figure I’ll be using it mostly for family trips. Good thought re: the expanded coverage winter tarp…I’ll have to try my 2QZQ griz beaks on it to see how they fit. I have a Blackbird for summer/jungle trips and a Bonefire 30F for the integral underquilt/3-ish season traveler. Love my Cuben fiber tarp from HammockGear…Thanks Derek. My wife and I are awaiting the release of Amok V3 : ) Your review was well written and insightful Derek; THX. Your “Ultimate Hang” eBook is on both our kindles and taken on ever adventure. Thanks! I should be getting a new version of the Draumr in a week to review. awesome review. i have the 2.0 and love it. last fall i went out for one last over night. the wind picked up a bit, but i was happy to realize the sides of the hammock angeling up actually block the wind really well. i’m looking forward to the 3.0 mostly for the bug net improvements. the little velcro strips grab the net while stowing it if you’re not careful. i have a few snagged areas on mine, but no holes. also, the net isn’t very breathable on the 2.0 making it kinda stuffy on warmer nights. all that should be fixed nicely with their changes to the 3.0. can’t wait!!! I’m testing v. 3 this week. I’m laying in it as I type and I can attest that the improvements are worth it. Quite impressive. lol nice! must admit i’m a bit jealous. I just noticed the 3.0 goes on sale this weekend (7/18-7/19) at some point. are you allowed to give further insight on the 3.0 other than the presser from AMOK? I’d really like to know if they changed the tarp and how the new mattress fit is working out? I have an exped 7 and i’ve had the foot end of it flip out of the little pocket and taco my feet at night. The tarp is changed. Bigger and has a slight hex shape for better coverage over head and foot. I like it. The pad is nice upgrade too. Zipper enclosure and pockets for different sized pads. ty so much! i keep refreshing their web store so i can order one! I appreciate the mountains of information, the thing is, I just want to go camping, not become an expert on gear. Can you just recommend 1 tent that rules them all? I mean after such extensive testing and several companies manufacturing, is it really that difficult to make something that coveres all the bases!? I understand your plight, Bill. There are several hammocks that may fit your goal — a single hammock that is ideal for camping. What I call “all-in-one” hammocks include everything you need: hammock, bug netting, tarp, suspension, and straps. Hennessy Hammock is a notable example. The Amok Draumr is another. The Clark Jungle Hammocks and the DD Jungle Hammock, Lawson Hammock, Pack-it-Lite, and Eureka! Chrysalis all have package set-ups. But there is a lot of variation between models, including weight, cost, durability, modularity, etc. I never throw out a single option because it is rarely a bulls-eye. I’m happy to chat with you offline to help narrow the choices a bit. Send me an email and I will work with you on your research. Hey Derek! I loved your review and am really wanting the amok v3. I’m getting into backpacking, and have never hammocked before. Due to the weight and size, would this be a wise choice? I guess it depends on how you backpack. For traditional backpacking, the weight of the Draumr probably isn’t an issue. However, if you want to go lightweight, you might want to consider other options as it is a heavier kit. I realize that not everyone is as concerned about weight as others, so much depends on your style. How does this compare to the Exped Ergo Hammock Combi? Since it’s the only other complete, diagonal hammock kit that I know of. The main difference between them is that the Draumr requires a pad to form the hammock. Without the pad you cannot lay in it at all. a personal note on pads from a (now ex) Amok user (we just had to many hammocks in our gear bag so thinned it out). My wife and I both used the ExPed 9L and they are nice pads. The fill-level should be experimented with. I had mine as soft as I could go (as little air to still work). I did this in part because I liked sleeping on my back in near-lounge mode and the less-air fill made this mode easier. My wife filled her ExPed nearly full as she enjoys sleeping on her stomach so the flat (and quite hard IMO) pad helped with this. I find it interesting that you can order this hammock directly from the CHINESE manufacturers for a fraction of the price. For less than the cost that Amok is charging for the hammock alone…you can get the hammock, pad and tarp…and still have enough left over to take your significant other out for a nice dinner. LOL! The product is EXACTLY the same as what Amok offers…as it is being sold by THEIR Chinese manufacturer. Perhaps this is a coordinated effort between the team at Amok and their manufacturer to help market the product to the masses and offset the costs of the next updated runs or prototype models…sometimes limited product market testing is done like this to evaluate the products being manufactured while paying for the re-tooling for the next product line that is waiting in the wings…on the other hand…I strongly suspect that it is more likely the typical behavior of Chinese cut rate manufacturing companies that love to stomp on the patents of companies that have entrusted them with new innovative designs…we have all seen the Chinese pilfering of patented products from so many different companies around the globe, as well as a ton of Chinese knock offs. If the Chinese are set up to fulfill the orders of the company which hired them to produce newly developed products…and those order have been met…why would they stop manufacturing them? They can keep pumping the products out…re-label the items under a different brand name and undercut the product developer, before they even get their feet wet in the meatiest part of business! They get paid by the company that they are ripping off…not only do the get to steal the product, but they also get to steal their customers! Next thing you know the product is available at a fraction of the cost at a Walmart near you! And just try going after them for patent infringement. Good luck! It is not the inventor or innovator who holds the keys…it is the manufacturer! And the Chinese are certainly in the drivers seat!